Liam had his check up today to see how his first full week home went. And he gained 9 ounces! He's now 4 lbs 11 oz. That was his largest weight gain ever! He must like it here! ;-) We sure do love having him home with us. 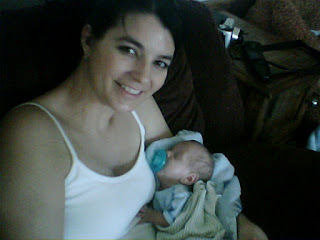 It was hard to adjust to being his mom full time. I always have had someone else there with him and monitors watching his heart and breathing! Liam loves being held. All those days laying in an isolette you'd think he'd be used to being alone in a bed... but nope...he'd rather be held now. The little stinker sleeps with me part of the night! But I'm not complaining! That is so sweet. I am glad he is doing so well. That is awesome! I know he feels so much love at your house! The picture is great! You look wonderful! what a beautiful picture. :-) I'm so happy for you that he is home. I'm sure he loves being with you guys too!